The Travis Walton abduction is well known to most people reading this. Suffice to say he was part of a logging crew on November 5, 1975 in the Apache-Sitgreaves National Forest. The abduction site is in the east central Arizona mountains, and is accessed only by old logging roads. After calling it a day, and with the sun going down, the crew of seven got in the truck to head home. As they traveled down the road, a UFO was spotted hovering off to the side. Travis got out, approached it, and was hit by a beam. The crew panicked and drove off, but quickly returned to find Travis missing. He was gone five days, and then reappeared just outside Heber, Arizona. For details on this event, see his site www.travis-walton.com or read Travis Walton’s book “Fire in the Sky”. Though the event happened 40 years ago, soil samples were collected from the site, along with nearby control samples. It should be noted that besides 40 years of weathering, a massive forest fire occurred in 2002 which devastated the area. Still, it was hoped that if a permanent change was made to the soil due to the UFO’s proximity, it would be detected. This laboratory is also in possession of wood core samples from the site. The trees were cored 24 years after the event in winter 1998/1999 by Mike Rogers before the forest fire. He sent cores to W. C. Levengood. Levengood passed them along to this laboratory September 2012. The core samples are intriguing because of the tree rings. Wide rings from the site trees show that from the time of the abduction in 1975, and for 15 years afterwards, they experienced rapid growth. Cores of trees just outside the site show no rapid growth. Furthermore it was observed in January 2012 that the wide rings are not concentric around the trunk. That is, they are elliptical and even wider where they faced the UFO. Some testing has been done on selected core samples and is not completed. This analysis will not be addressed in this report. The objective of this project is to determine whether the analysis of the soils will detect any anomalies which can be related to an unknown craft (UFO). Also it hoped to be informative to other scientists/investigators that may be able to add input and further interpretation to build on what is found. It is also desired that the information and testing serves as a protocol for future testing of soil samples related to UFO events. That is, which procedures and tests should be done. Note: While this project was personally generated and primarily financed by this laboratory, we must acknowledge and thank our friend and colleague Dr. Sampath Iyengar for discounting and partially donating his services for EDX elemental analysis and XRD characterization of the soil samples and magnetic particles. The composition of each the soils consist of primarily quartz, mica and feldspars (microcline) minerals with some humates (organics). Small amounts of metallic particulates are present which contain iron oxide permutations of hematite (Fe2O3), ilmenite (FeTiO3) and magnetite (Fe3O4). Quantitatively the amounts of these components vary between the samples. It is revealed that iron containing particulates amounts are higher in the site soils compared to the control soils. Furthermore, there is indication that the levels tend to be higher in the surface soils compared to the sub-surface soils of the site samples. This laboratory speculates that the hovering craft propulsion system has a powerful electromagnetic effect thereby drawing (and concentrating) these iron particulates toward the surface. This has been observed in the analysis of soils from other sites where UFOs landed or hovered close to the ground.1 It was more specifically noted that sample 2 contains less particlulates compared to the other site samples, but slightly more than the controls. Soil 2 is approximately where Travis landed after the beam hit him. Perhaps this suggests that the UFO was not influencing the metal content as much at this location. The exchangeable cations (calcium, magnesium, potassium) are significantly higher in the site samples than the control samples. This would indicate some chemical changes in the site samples. The detection of the differences in cationic activity in the soils is intriguing. However, compositional differences, e.g. such as clay (microcline) content may affect the CEC values. (The amounts of minerals were not determined.) It very speculative that the effect is due to a UFO, because the samples were collected 40 years after the event. But, it should be noted that this laboratory has analyzed substances from other events which were in proximity to a UFO. And, there is indication that while hovering an electronic force field surrounds the craft, causing an ionizing effect to materials in close proximity. For example, in the famous Delphos Kansas event, a craft was observed depositing what turned out to be mostly fulvic acids which chemilumenesced for almost two days. In Poland, a hovering/landed craft deposited vitrified soil chunks which glowed for months. 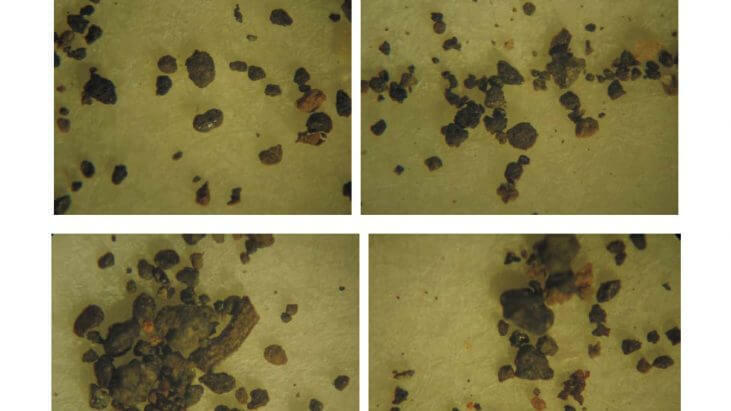 We believe this analysis justifies additional examination of soil samples from the site. It was under sampled and more metal particulates analysis is needed for confirmation of their relation to the UFO effects.